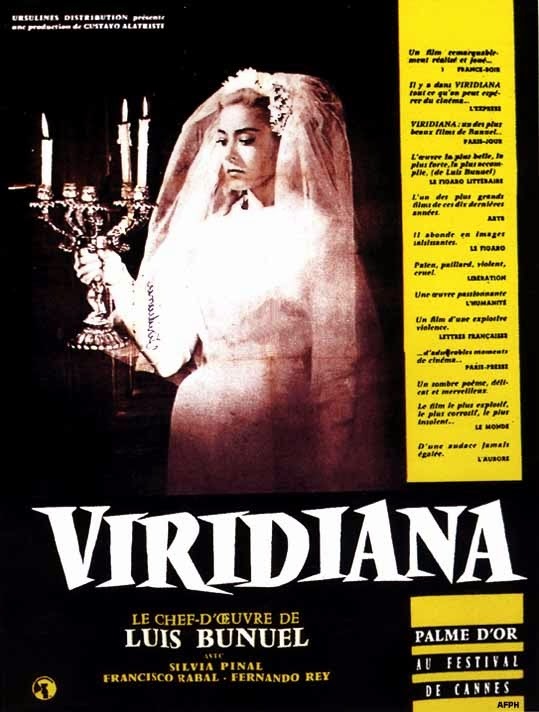 Iconoclastic writer-director Luis Bunuel's VIRIDIANA was pretty hot stuff in 1961; I do fear that in our now-jaded era (hey, a just dropped the name of Jaded Era, a band that wouldn't give me an interview for an article once), not many will see what all the fuss was about. Still, it's got a sinister edge to it that I think still comes across. The production was considered the utmost in anti-Christian blasphemy and sacrilege in its day. But, just as with the novel The Satanic Verses, you'd have to be really steeped in the religion to get what all the fuss is about with the zealots, especially in today's tasteless-movie marketplace. The title character (played by Silvia Pinal) is a pretty young novice nun, about to take her vows and enter a Catholic convent for life. Her mother superior, however, persuades the reluctant Viridiana to first pay a grateful visit to a wealthy uncle who has forked over money to Viridiana (and the school) all her life. The heroine accepts, even though she presumes to shun the material wealth of the guy's mansion in favor of an austere religious life. And she suspects the guy is a bit of a creep. Viridiana is thus surprised that the older man is a courteous and principled host...But in fact, he's just infatuated with the lovely niece because she looks like a wife who died on him during their wedding night. The fellow drugs Viridiana and nearly rapes her, but, suffering an attack of conscience, he confesses all and commits suicide instead. By twist of fate, Viridiana has now inherited his fortune. Though she thinks she's become too tainted to ever be a nun, she still determines to use the money to do Christian charity. Meanwhile, her half-brother and other borderline-sleazy elements of Viridiana's family show up, all of them cynical about the girl's altruism. They are proven correct when Viridiana makes the disastrous mistake of trying to pull a WWJD and invites into the home a tribe of loathsome street people. It's no spoiler alert (or is it these days?) that this leads to the famous climax, in which Bunuel uses the homeless mutants to stage a parody of Da Vinci's Last Supper, with a blind beggar in the Christ role (I read somewhere that Bunuel said he harbored a special disgust for blind people. Nice folks, these filmmakers). It's still a pretty electrifying screen moment, even if much of the rest of the film and its symbolism mainly resonated better against the cultural backdrop of quasi-fascist mid-20th-century Spain. Native son Bunuel, exiled for decades by the Catholic-dominated government of Francisco Franco, had won so many honors at international film festivals that the Spanish hierarchy finally invited him back, LeBron-style, into the country to make any film he wanted, as long as the script didn't scandalize the censors. The scenario for VIRIDIANA (which is indeed the name of an obscure Catholic saint), sans the visuals, didn't set off many alarms, and Bunuel went ahead to make the film unhindered. And I have to say, getting his anti-Church digs past Franco's cultural commissars was probably the material's grandest achievement, for me.